Lettuce is regarded as a cool-season vegetable, and in most home gardens it is planted in the early spring, harvested in late spring to early summer, and is then discarded in favor of other vegetables for the middle of the summer. Some gardeners may replant a second crop of lettuce as the days grow cooler in fall, but most do not grow lettuce at all in the mid-summer period, focusing instead on warm-season vegetables. Savvy gardeners may plant lettuce among other warm-season vegetables, such as tomatoes, so that by the time the lettuce is finished in early summer, the warm-season vegetables are beginning to take over the garden space. Lettuce grows best in a temperature range of about 45 to 75 F. In weather hotter than this, the leaves begin to get bitter to the taste. When leaf lettuce bolts—begins to send up its flower shoots—it's a signal that the production of edible lettuce is done for the season. Leaves harvested after this point will be quite bitter to eat. But there are some ways in which you can keep lettuce producing throughout the summer. 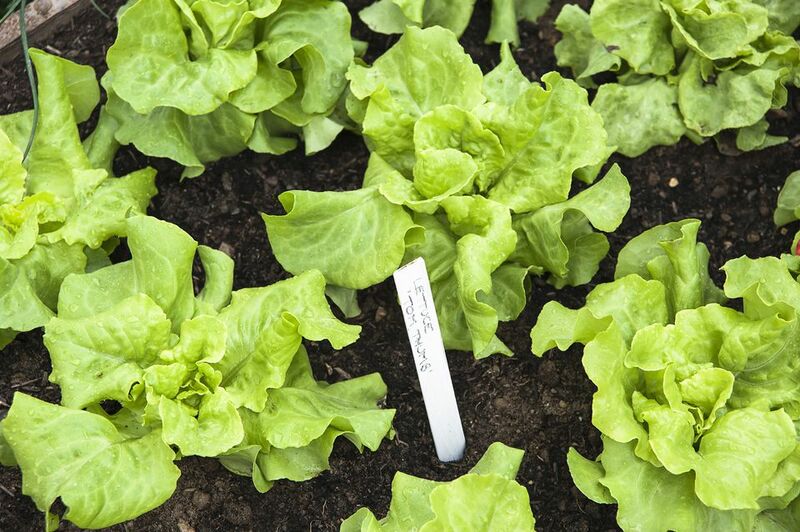 First, choose leaf varieties rather than head-forming lettuces. You can start harvesting leaf lettuces as soon as the outer leaves reach about 4 to 6 inches in height. If you cut just these outer leaves, it allows the remaining center leaves to continue growing. This is called "cut and come again" harvesting, and some lettuce varieties are marketed as being especially suitable for this kind of harvesting. Not only do you get to start harvesting early, but cutting like this tends to shock the lettuce plant, preventing it from thinking it has matured and is ready to bolt and go to seed. Head-lettuces, on the other hand, take a while to develop mature heads, and they sometimes bolt even before decent edible heads can form. Leaf lettuces are a much better choice for continued production. If you keep lettuce leaves cropped short, the plants will continue to produce new leaves well into the summer. Allowing leaves to become large and mature signals the plant to send up seed bolts, which is the point where it will no longer be edible. Keep your leaf lettuce cropped short, even if it means discarding some leaves because there is more than you can eat. Plant your lettuce in the shade of taller plants, like tomatoes, corn, or even vining crops like cucumbers and squash. You can do this when you first start seeding in the spring, or wherever there are bare spots in the garden to fill. Lettuce needs more sun in the cool spring than it does in summer, and positioning lettuce plants around taller plants, such as tomatoes, will provide full sun in spring while the tomatoes are still short, but will offer relief from the intense summer sun. Sun cloth suspended above the lettuce plants on poles can also help shade the plants and delay their bolting impulse. Regular watering makes plants very forgiving of high temperatures. The evaporation of water from soil provides natural cooling. Water your lettuce plants every day—and even more often if it is extremely hot and dry. The lettuce leaves are mostly water and will desiccate and wilt in strong sunlight and dry soil. Lettuce roots tend to be shallow, so frequent watering is more important than deep watering. If all else fails and it looks like your lettuce plants are ready to bolt, dig them out of the ground and replant them. As with "cut and come again" harvesting, this is a shock to the plant's system and it will once again focus on growing roots and delay setting seed. Don't keep them out of the ground or allow the plants to dry out—just the act of lifting them and immediately replanting is enough of a shock. Find a somewhat shady spot in your garden and give it a deep soaking of water. Then lay a board over the damp soil. The board should be at least as large as your intended planting area. Periodically lift the board and re-soak the soil for another two to three days. This should lower the temperature of the soil. Now, plant your lettuce seeds in the prepared area and water them in well. Replace the board over the seeded ground. Lift the board and water every day until you see signs of germination, at which time you can remove the board. It should take about seven to 10 days for the lettuce seeds to sprout. Keep watering whenever the soil dries out. This can mean watering more than once a day, while the seedlings are tiny. Once the plants are a few inches tall and ready to start harvesting, they should not need a great deal of additional water.